Running freshly compiled 3.0.2 here and seeing many windows rendered in a compressed style. Not for major windows such as Piano Roll, Arranger, or Event List of course, but plugins and now Mixer A.
I started a thread with the creator of the avldrums plugin here which may reveal the root cause? and not remembering their positions and sizes. Before the fix, many windows would open way too small. Fixed generic GUI windows' initial position/size. Fixed saving/restoring pos/size of generic GUIs. Reported a Qt BUG #64773 regarding ignoring setting of position upon show()! For said bug, wrote a MusE workaround. Tested all generic GUIs OK.
TODO: Similar check and fix other non-QDialog usages for pos/size settings. Unfortunately, certain plugins' default size could not be obtained. DrumGizmo was one of them. so that at least they could be seen. In fact DrumGizmo was my test Guinea pig, I paid special attention to it because it was so small and horrible looking. I finished only when I was satisfied that DrumGizmo looked OK.
Before those fixes above, you should have seen how small they were. Smaller than now. However, D'oh!, those fixes were made using a previous version of DrumGizmo, to look just OK.
DrumGizmo has added some cool new stuff. So my carefully chosen default size values are now inadequate, and it looks horrible again, just like your picture. Not sure what can be done. If I increase my chosen default size, certain other plugin windows might look too big. is that the graphic type they are using does not support it. Gosh I'll have to revisit to see if really MusE can do something, or if DrumGizmo could do something about his. Well, at least this problem only happens when the GUI is first opened. Right? 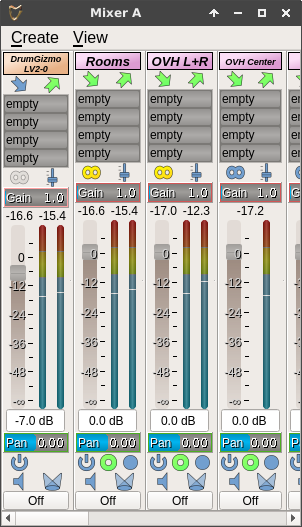 OK I just opened DrumGizmo in Ardour and it looks perfect. Looks like I'll have to revisit and try to fix this. Hang in there, can't promise anything soon. PS: It would be better to report such things on our bug tracker. Gives better communication and status updates and so on. Don't be shy, if it looks like a bug, ours or not, feel free to report. Thanks again for the response. I actually plan to load all my plugins via Carla anyway (that way I can save profiles). That said, I wouldn't have even brought this up if it weren't for the fact that I saw the behavior with the Mixer A panel. 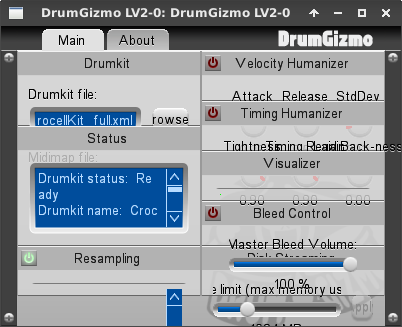 Totally can appreciate the thing you mentioned about an older version of Drumgizmo; makes perfect sense. Maybe a clue could be found in Carla's source? In other words, how do they manage to open DG properly? I'd dig into it but I'm not a developer. Also, will take care to utilize the tracker going forward. I just wasn't sure if this was a bug or not. Going forward, if I bring something up here that's better maintained over there, just say the word and I'll create an appropriate ticket whether it be a bug report or feature request. Thanks again. - Further LV2 GUI fixes - see 29.11.2017. Fixed X11 GUI size. to shrink below its supplied size. Thanks very much for rattling my cage on this one ! Turns out that DrumGizmo does in fact supply a size to the host. Sorry guys for the cloudy misinformation blah-blah before. Was some unfinished business just like my TODO said. My memory had faded on that slog of a code fest... The LV2 code is mind-numbing tricky. You mentioned the mixer as well. But it actually looks fine in the picture. although I think there may still be a wee bug where sometimes it doesn't. That did the trick. Thanks again.